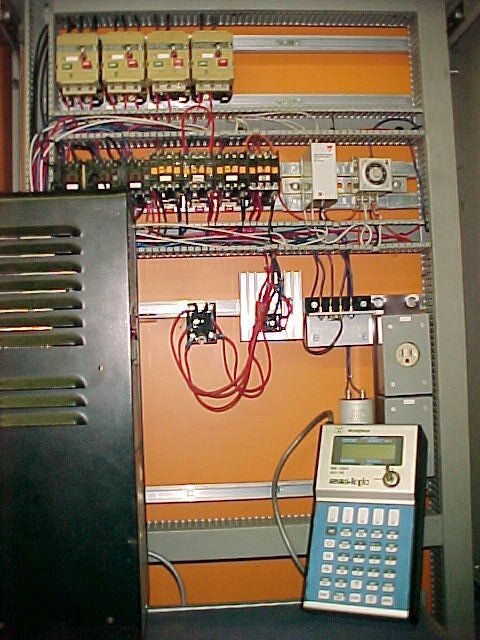 The PLC that controlled Bountys Revenge was a Westinghouse Numalogic PC700 this was coupled to dedicated electronic controls to read the position of the encoder and controll the speed and direction of the main drive wheels, nothing like the normal inputs and outputs found on the Snowy River Rampage, Beastie and Bush Beast. The encoder was always the first thing to check if a postioning problem occured. When the ride was commission (before the park open) I was given hands on training from the guys who actual put this together (I think they were from Sweden). If you know what little leds to look for you could diagnose problems relativly easy. One day while on cruise patrol, we were at the Bounty when all the conditions were perfect. The ship swung from side to side and when it reached the top it just stopped for what seemed to be forever. The encoder on top was to ensure the PLC knew where the ship was at all times, it would also sync the main drive wheels. A safety was built into the system, if an encoder input was not received with in 13 seconds, it would assume a broken chain on the encoder and put the ship in to estop mode. The ship would continue the arc but come down on all 4 tyres that were locked up, lots of smoke and lots of sreams. I remember one time we had a positioning fault where the ship would complete a cycle and then stop off centre and trip out the PLC which took an absolute age to faultfind and fix (1 Month). To keep it running the Cruisers (Duty Maintenance Fitter and Electrician) had to be permanently posted at Bounty's all day to reset the ride after every cycle. In the end the encoder at the top was the faulty component.